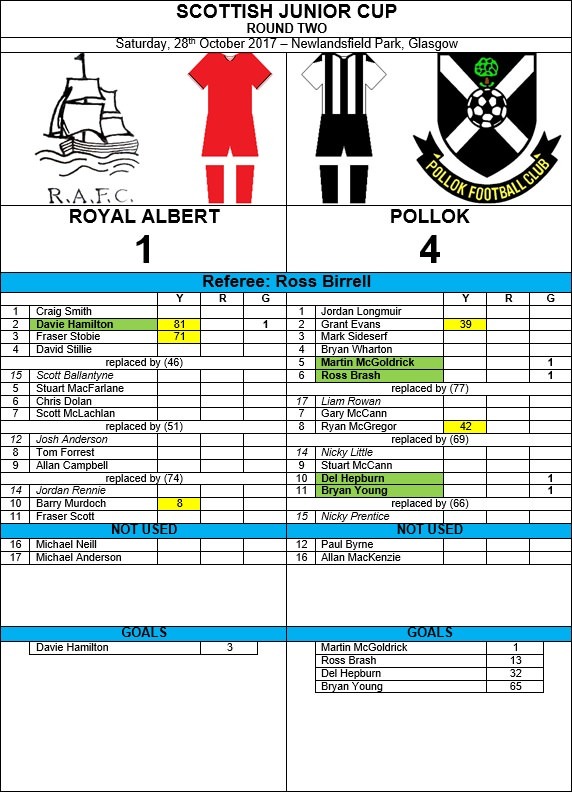 Pollok progressed to the third round of the Scottish Junior Cup on after a comfortable 4-1 victory over Royal Albert at Newlandsfield Park. ‘Lok got off to the best possible start netting after 55 seconds, the ball falling kindly to Martin McGoldrick to rifle through a crowd when the Albert defence failed to clear their lines from a corner. Royal Albert responded almost immediately, equalising in the 3rd minute with a thumping 30 yard first-timer from Davie Hamilton. It was shaping up to be an end to end cup-tie when Pollok regained their lead in the 13th minute, Scottish Junior International Ross Brash lashing home from the edge of the area. Del Hepburn extended the lead in the 32nd minute, the ball breaking kindly to him in the Royal Albert penalty area where he kept his composure to beat goalkeeper Craig Smith. The scoring was completed in the 65th minute, Hepburn turning provider when his flag kick was headed home at the front post by Bryan Young.